Spain's yields are lower than Italy's at the short end but higher for all the longer dated bonds. It's worth understanding the reasons for this "inflection" in the curve differential. Reuters: Experts estimate Spain needs to raise about 177 billion euros gross in 2012. This compares with Italy's plan to raise 450 billion euros in gross terms, including bills and bonds. That means that in the short term, Italy's bonds will dominate the supply (particularly bills), putting some upward pressure on short term Italian yields. 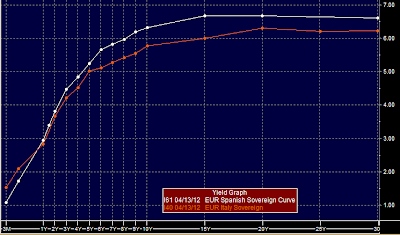 But in the long run the market believes that Spain presents a materially greater risk than Italy.